My initial sniffiness at the Elite: Dangerous Kickstarter pitch now looks ludicrous given my current pledge level: I have my commander name saved (Buck Sexington), my real name will be an NPC in the game, and I’ll be taking part in the first round of beta testing. I was aiming for the Explorer level pledge (“Have the option to start on the edge of explored space with a long range version of the Cobra Mk III and 3,000 CR”), but I still ended up a bit higher. Money well spent? I have no idea, but it has kept me more engaged in Dangerous’s development process (I have “Always Display Images From Frontier” checked in my inbox, for example). 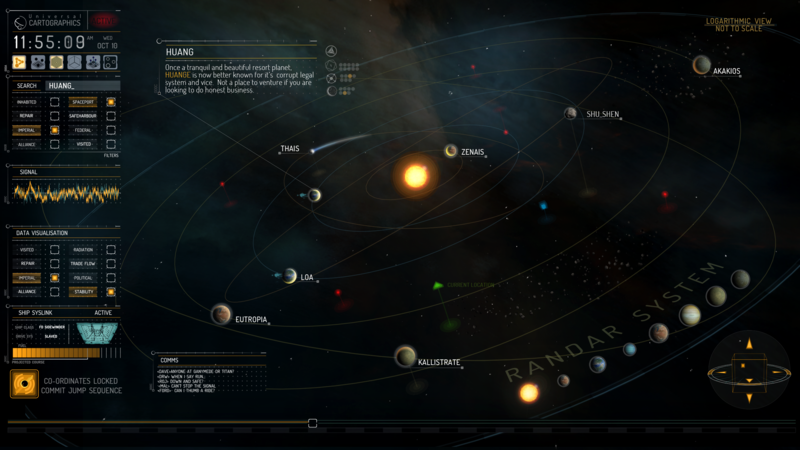 So I thought I’d share my excitement at the recently released screenshot of the solar system map. This glimpse into one of the game’s functions is heartening to me. Either middle click it, or right click it and open the link in a new tab. I used to do trade runs between star systems, as it seemed like planet-to-planet trading wasn’t worth much of my time, but with the “trade/flow” toggle to the left, it suggests a greater diversity within the star’s orbit. I’d guess a lot of those toggles work on the larger scales, too: Federal and Alliance toggles only make sense if it takes whole star systems into account, as those divisions existed system-to-system, not planet-to-planet. Unless that’s changed. I should probably pop into the design forum that I paid to access. How will you use the toggles? Frontier presents these scenarios. I have a cargo hold full of beans that I need to sell? Activate the trading data filter and set it to highlight non-agricultural systems. If your cargo is small, perhaps select a small/low traffic system where prices are likely to be highest, and plot your course. Set the filters to highlight high piracy and low security level, and then head to such a system. When I think of how I’ll play the game, I can imagine myself as a rogue, dialing-up a new bounty in the manner above. Realistically, I’ll probably use it to help move robots between Sol and Barnard’s Star. That signal bar is interesting, and there’s nothing in my Elite memory banks that could account for it. Any ideas?